Wilmot’s Haley Lamberson, shown here driving up the lane at Elkhorn, was one of several contributors in the Panthers win against Westosha Central Friday (Jake Hill/The Report). In the first 10 minutes of Friday’s contest between Wilmot Union High School and Westosha Central, Panthers junior Riley Alexander admitted the shots weren’t falling in, but they eventually found its shooting rhythm by the middle of the opening frame. The shooting rhythm, including two 7-0 scoring outbursts in the first half, propelled the Panthers to a 29-13 edge entering halftime. Wilmot then outscored the Falcons 34-12 in the second half to come away with a 65-25 Southern Lakes Conference decision. With the Panthers victory, they extend their win streak to seven games, and jumped to 11-6 overall and 8-1 in the SLC. Since the 2010-11 season, Wilmot has won 15 consecutive games against its county rivals. According to Panthers coach Jerod Boyd, whose team struggled to penetrate the paint to open the contest, the squad switched to a man defense in the second half to force more turnovers. “We were just trying to be more athletic and make them turn the ball over,” said Boyd. For the Falcons, the loss dropped them to 2-13 overall and 2-6 in the SLC. Falcons coach Mindy Stewart said Wilmot presents a constant challenge. “They did what we expected, they are a quality team, their girls work hard all season,” said Stewart. Following a bucket by Wilmot junior Karoline Klahs, who snagged the opening tip, the Falcons did not allow the Panthers to build a commanding lead to start the contest. Courtesy of seniors Brianna Reid, tasked with replacing injured starter Stephanie Dopuch as the offensive leader, and low-post threat Shannen Griffiths, Westosha Central kept the game close. After Klahs’ bucket, Reid responded with one of her own to put the contest into a 2-2 deadlock, before Alexander connected on her first 3-pointer to give Wilmot a 5-2 lead. Griffiths, however, drew a personal foul in the paint, which sent her to the free throw line, where she converted one of two shots to cut the Panthers lead to 5-3. 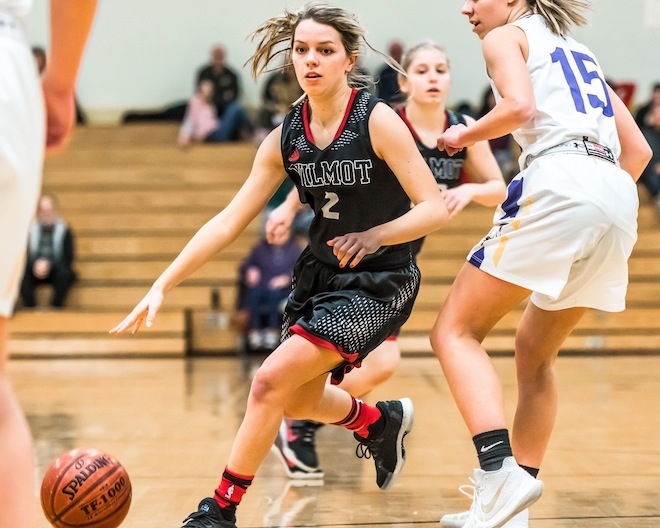 The Panthers responded with a sophomore Kenzi Ketterhagen basket followed by two senior Ashley Lesko free throws to make it 9-3 in favor of Wilmot. On the next possession, Reid trimmed the Falcons deficit to 9-6, thanks to a 3-pointer. Wilmot sophomore Julia Hickey answered with a 3-pointer to reclaim a 6-point lead. Westosha Central, which responded with a Shay Mulloy basket and a Griffiths’ free throw, again made a 3-point game with less than eight minutes left in the first half. “Their post players were clogging the lanes, and we couldn’t get to the hoop, so we lived by the 3-pointer and our shots weren’t going in,” said Boyd. With 7:20 left in the first half and Wilmot ahead 12-9, Panthers junior Haley Lamberson sparked the first scoring run with a 3-pointer. Following Lamberson’s shot from the arc, the Panthers received back-to-back baskets from senior Morgan Zenon and Alexander, which gave Wilmot a 19-9 lead with 5:48 remaining in the first half. Despite a jumper from Falcons Mulloy, the Panthers responded with their second 7-0 run, starting with two sophomore Kenzi Ketterhagen free throws. Ketterhagen, who converted six of eight free throws, finished with 10 points for second on the Panthers. Following Ketterhagen’s free throws, Zenon added a bucket before Alexander drained another 3-pointer, which swelled the Wilmot lead to 26-11. Wilmot, which allowed a layup to Falcons’ senior Siera Sieberth, closed out the first half with a sophomore Karina Leber free throw and a Hickey bucket to take a 29-13 edge into halftime. The Panthers, who produced a 7-0 run in the second half, added a 15-0 outburst capped off by a junior Delaney Brown basket in transition to widen their lead to 59-19. Brown’s basket, which came with 6:25 left of regulation, forced the contest into a running clock. In total, 12 Wilmot players scored at least one point. For Reid, who finished with five points, she was called upon to help lead the offense while Dopuch has been sidelined. “Our girls see her as a leader, and she is one of those kids that is always willing to bring the ball up court,” said Stewart. Griffiths, meanwhile, knocked in a team-leading six points for the Falcons.